There seems to be no end to the common man's woes. Food inflation advanced to 15.46 per cent in the week ended September 11, as cost of cereals, select vegetables and milk rose due to supply disruptions caused by unusually heavy rains in many parts of the country. Week on week, food inflation climbed 0.36 percentage points from 15.10 per cent on September 4. This is the fourth consecutive week that the rate of food prices has risen, although signs of moderation had appeared in July and stayed on through the first half of August. Many parts of the country including Delhi, Haryana, Punjab, Uttar Pradesh, Himachal Pradesh, Assam and even the desert state of Rajasthan have been witnessing torrential rains that have disrupted supplies of staples. While the aam aadmi gasps because of a steep rise in prices of food items, policymakers come up with one filmsy formula after another. These formulae seem to be mere theories on paper, and don't really serve much purpose. Click NEXT to know where we stand as far as inflation is concerned and what do the think tanks say . . .
Finance Minister Pranab Mukherjee said last month that handling inflationary pressure is the collective responsibility of all political parties. 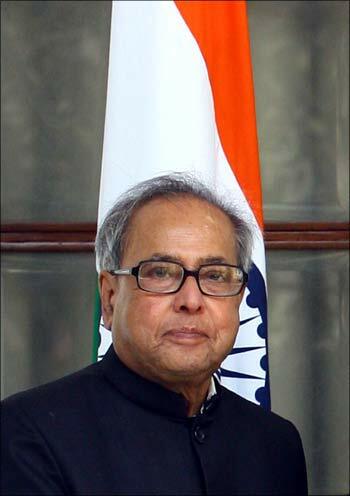 Responding to the price rise debate in Lok Sabha, Mukherjee said that it should be tackled by leaders across all the political parties. "I seek the support of all political parties in this regard. If we don't present the Bill in the current session, the implementation of tax reforms will be further delayed," he added. He further said the central government alone cannot be blamed for price rise as today seven states are being ruled by the Bharatiya Janata Party; three by the Left parties and Uttar Pradesh by Bahujan Samaj Party. Levies on petroleum products account for 34 per cent of states' revenues, he added. Prime Minister Manmohan Singh told the Supreme Court, which recently directed the government to distribute foodgrains free to the poor, not to get into the 'realm of policy formulation'. "How can foodgrains be distributed free to an estimated 37 per cent of the population which lives below the poverty line," Singh asked during a recent interaction with editors at his residence in New Delhi. "I do recognise that food should be available to the people below poverty line at concessional prices. We have not allowed any increase in the issue price of foodgrains to people below poverty line since 2004," he said. To the extent possible, the government had taken adequate steps in this direction while noting the Apex Court's concern that food should be available to the poor at affordable prices, he said. At the same time making food available free would destroy incentives to farmers to produce more. If there was no no food available there would be nothing to distribute, he said. Taking exception to Agriculture Minister Sharad Pawar's statement, the Supreme Court had asserted in August that it had ordered the free distribution of foodgrains to the poor instead of allowing them to rot in godowns and it was not a suggestion as made out to him. "It was not a suggestion. It is there in our order. You tell the minister," the court had told the government counsel. 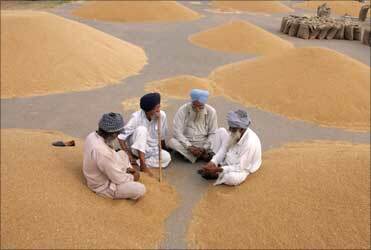 Image: Farmers sit beside heaps of wheat at a grain market in Chandigarh. Overall inflation is expected to fall to 6.5 per cent by end of this year, and 5.5 per cent by March, Prime Minister's economic panel said on Thursday. Week on week, food inflation climbed 0.36 percentage points from 15.10 per cent on September 4. However, on overall price rise, Economic Advisory Council Chairman C Rangarajan said, "As per the new series for August (2010), the wholesale price index showed an inflation of 8.5 per cent. This is one per cent less than the old series." He said the difference arose because of changes in the weights attached to different commodities. Certain commodities which witnessed sharper increase in recent period have also registered a lower weight in the newer series and ". . .that's why we have a lower inflation", he added. "Our own estimation is, according to the new series, the inflation will fall to 6.5 per cent by end of December and 5.5 per cent by March (2011)," Rangarajan said. The new inflation series with 2004-05 as the base year has 241 more items than the old series with 1993-94 as the base year, which reflected the price rise in 435 articles. While the progress of the monsoon has brightened the prospects of foodgrain production, the fall in sown area is a matter of concern, Agriculture Minister Sharad Pawar clarified to Business Standard in a recent interview over the debate regarding the proposed Food Security Act. The area under foodgrain cultivation increased from 120 million hectares in 2004-05 to 124 million hectare in 2007-08, the minister said. 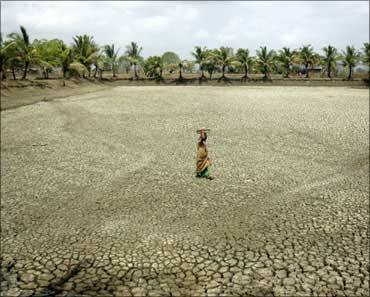 Thereafter, it declined somewhat, because of vagaries of weather and unprecedented drought in 2009-10. To make agriculture remunerative on a sustainable basis, a substantial increase in maximum selling price of major cereals, ranging from 39 per cent to 78 per cent, was effected during the last five years. MSPs of pulses and oilseeds were increased up to 104 per cent during the period. There is no doubt that this has encouraged farmers to produce more. Total foodgrain production has increased from 198.4 million tonnes in 2004-05 to 234.5 mt in 2008-09. Pawar informed that last year's estimated production of 218.20 mt is to be seen in the backdrop of an unprecedented drought. However, the various mitigation measures helped reduce the loss to the minimum. Image: An agriculture labourer toils in a farm. Food Corporation of India is sitting on 60 million tonnes wheat and rice while millions in India are starving. Despite criticism for procuring foodgrain without creating adequate storage, Food Corporation of India plans normal procurement this kharif season. FCI chairman Siraj Hussain recently told Business Standard in an interview that the government-owned agency had no plan to go slow on buying paddy at the minimum support price announced for this season. According to trade sources, FCI procured nearly 30.8 million tonnes rice out of the country's total output of 75.9 mt last season. It bought 22.5 mt wheat out of the total output of 79 mt. As on September 1, FCI held 20.5 mt rice and 29.9 mt wheat. One-third of all this is in the open. The storage is sufficient to meet the annual intake through the ration shop chain, the public distribution system. 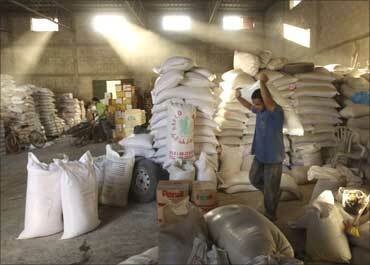 Analysts estimate nearly 10 mt grain got spoilt last season due to shortage of warehousing space. The result was an order from the Supreme Court to distribute grain among the poor for free or at a nominal charge. 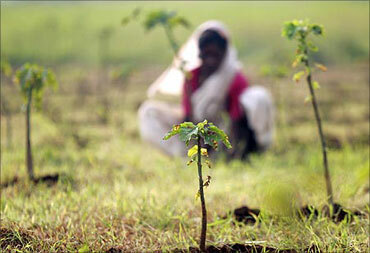 Prime Minister Manmohan Singh has publicly said this is not practical. Recently, FCI refused to buy the PAU-201 variety of hybrid rice, with an estimated output of around 1.6 mt in Punjab, due to black spots on the grain. This left a question in farmers' minds about how FCI will procure this season. 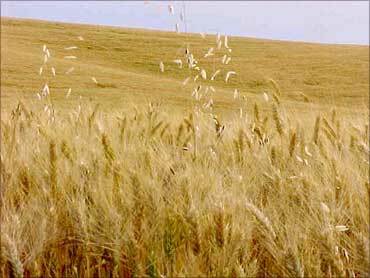 Image: A man carries a sack of wheat. Recently, rediff.com columnist M R Venkatesh wrote: Economic textbooks tell us that inflation is a function of cost push and demand pull. The former implies a scenario wherein inflation is fuelled through increase in input costs, while the later is caused by mismatches in demand and supply. But all these have been dynamited by real life developments of the past couple of years. Of late, there are a new class of global investors -- investment by the financial sector in the commodities futures market. What is worrying analysts is the growing influence of these players, who tend to take positions that exert extraordinary pressure on prices. Moreover, their activities are obviously coordinated across currency, stock and commodity markets, Venkatesh added. Crucially, these players have a symbiotic relationship with sections of the media. In the process, the traditional economics seems to have been completely turned on its head. Adam Smith, one of the founding fathers of economics, spoke of the 'invisible hand of the price mechanism'. He described how the invisible or hidden hand of the market operated in a competitive market through the pursuit of self-interest to allocate resources in society's best interest. This remains the central view of all free-market economists. The price mechanism is a term used to describe the means by which millions of decisions are taken each day by consumers and businesses. India, at the moment, is reeling under an acute inflation mainly because of the rise in prices of agricultural products as well as a recent hike in petro prices. What this means is that if prices in the basket of goods that is used to measure inflation are rising, then effectively it is inflation. Inflation is calculated using a basket of hundreds of common items. The price increase is then multiplied by their weightage or their relative importance as a percentage of consumer spending. As many as 435 commodities in India form a part of this 'basket'. Data on the price level of each of these commodities is tracked through the Wholesale Pr ice Index which is an indicator of movement in prices of commodities in all trade and transactions. This is also the price index which is available on a weekly basis with the shortest possible time lag only two weeks. The Indian government has taken WPI as an indicator of the rate of inflation in the economy. But prices of different items rise at different rates. So if items of higher weightage cost less (showing low inflation) and certain other items (of lower weightage, like vegetables) cost more, the overall inflation rate will be reflected as low. However, you will end up pay more for the vegetables despite inflation rate being low. Image: A SEZ in Pen, Maharashtra. The government needs to put more stress on agriculture. Globalisation is welcome but not at the cost of farming. There has to be a proper, balanced long-term investment plan in agriculture. Unless the supply is increased, prices of food materials will never come down. The government should try and put a brake on mindless hoarding, reckless speculation and unbridled profiteering. 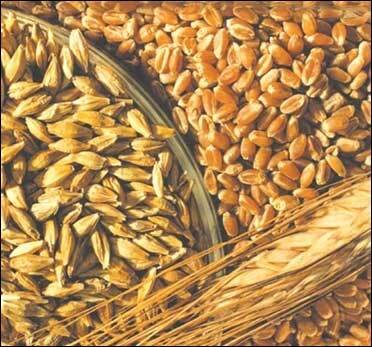 The government can release foodgrain stocks available with the Food Corporation of India. Why should wheat and rice prices rise when India has near record stocks of foodgrain. The government can import potatoes, onions and pulses. There is no dearth of forex reserves in India at the moment. Last but not least, it has to be remembered that all these measures can be successful only to the extent we can control population growth. 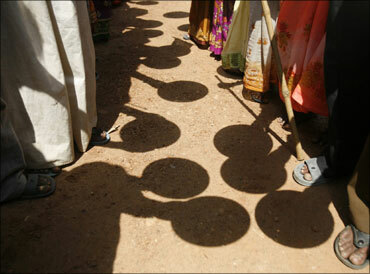 If UPA govt tackles inflation, it will collapse!